Clark and I held a house party for John Kerry on Saturday, part of a large and organized party wave all across the country. Our guest list was fairly small, but I think everyone had fun. Kerry's people sent out a phone number to a conference call in the evening during which Kerry spoke, fairly well, I thought. I decided we should have Boston Baked Beans and Boston Cream Pie in honor of the good senator from Massachusetts. For ease of serving (if not making), I made little individual ones [I've been trying all day to insert a photo of the lil' pies, but Typepad is having none of it. Maybe tomorrow.]. As soon as I tasted one, I remembered why my siblings and I would beg my mom to make a Boston Cream Pie. Yum! As I made them, however, I realized why she didn't make them as often as we asked -- they take some work. Yikes! And I used a cake mix and pre-made frosting, which she probably eschewed, though I did make the custard from scratch. You know what's easy to make from scratch? Custard!! * And boy, was it tasty. I had about three tons leftover, so yesterday's breakfast was a banana cut up into a bowl of custard. Well, it has milk in it. For the party I made mini cupcakes, slit them right under the top with a bread knife (but did not cut the top totally off), put in a little custard, and slapped some frosting on top, leaving a margin for ease of pick-up. They got a lot of compliments. Knitting, knitting, knitting...Working on finishing the body of the poncho, which I think will happen soon. I don't think I will go as long as Amy did, seeking more the mini look. *This is not the recipe I used, but it's very similar. My recipe did not include orange zest. 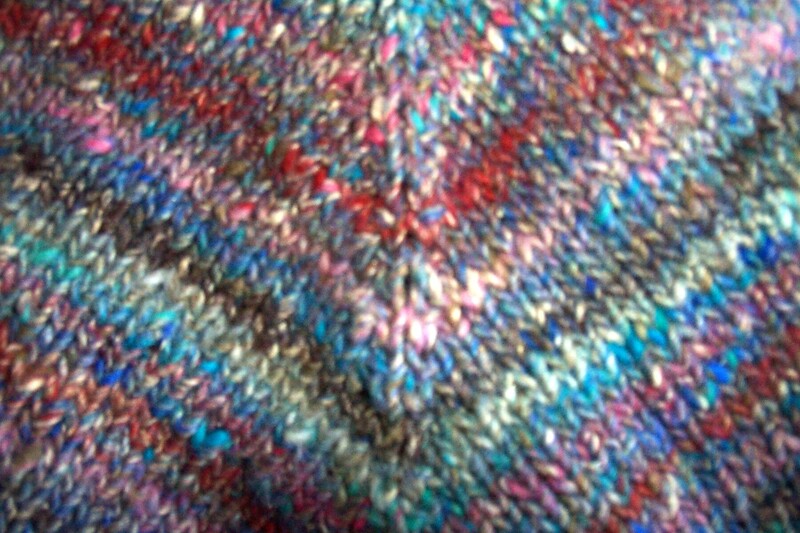 So, here's what the Noro knitted up is looking like. Although the body is not yet finished, I had to try out my little idea for the collar: a sort of wide turtleneck with lattice cables. I followed the collar portion of a sweater pattern in a Sandra magazine that I bought at an LYS recently for 33 cents. I'm not sure I'm going to keep it (I think there's slightly too much fabric under it for it to lie just right), but it's blocking now and we shall see. Whatever happens with the collar, I'm excited about wrapping this baby up -- and wrapping up in this baby! Would it kill me to update? Let's try it and see. I am working on a poncho from the Noro Shinano yarn I got from Threadbear. I love the yarn and the colorway! I'm using a pattern that Amy Singer (of Knitty) wrote and kindly shared on her blog in May, though I'm doing something different with the collar. Typepad is not letting me post photos at the moment, but I'll keep trying. One sleeve for the Sweater Called Kate is almost finished -- my, that All Seasons Cotton knits up quickly. Hope your own projects are flying off the needles! about Matt, Rob, and Threadbear! I gave them a ring last Thursday and had a wonderful conversation with Rob, who was uncommonly friendly despite the fact that before he picked up the phone, he didn't know me from Adam's off ox. I didn't find out till later that they were headed out of town; he took a lot more time with me than he had to. But most amazing of all, my yarn arrived the following Monday. It could have arrived Saturday, that is, a day and a half after I'd ordered it, if the postal service hadn't been marking our national mourning in its own way. This blows my mind. I got six skeins of Noro's Shinano, colorway 10, on sale, nice price, with which I am making a poncho. We're not ready for prime time yet, but -- oddly enough -- when I called them, Rob was writing his post (June 10) about the Sophie he made in this colorway and felted, so you can see it on his blog. The bag is just cute, cute, cute. I hereby resolve to place lots more orders with them. You know they're having a sale on the yarns they (used to) get from KFI, right? They also just got some Phildar stuff. The Kate Sweater's back is finished, and its front is coming along. I'm taking it to KIP tonight -- come as you are! 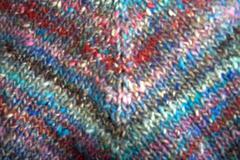 About ten days ago, I cast on for the Sweater Called Kate, the Phildar pattern that launched a knitalong. I was inspired by Amy and encouraged by Carolyn -- who can resist those guys? I'm enjoying it. I'm using All Seasons Cotton and like it very much, though some of my stitches are wonky. Since other people enthuse about the evenness of their stitches with this yarn, I know it's operator error. But I'll survive. Hope you have a tremendous weekend! I was so happy when the Linen Drape-along came along; I'm sure this yarn would have sat and sat and sat without the nudge, and I now have a new summer top that I think I'll enjoy for a long time. Many thanks again to Alison. needles: US 5. Note to self: don't be a ninny; use 5s, not 4s, with this yarn. mods: The moss stitch band at the bottom harks back to Flourish; waist shaping is from Essence; the top of this top is Petula. (All Rowan patterns.) 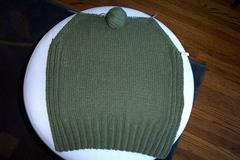 It was knit in the round up to the armholes, which, relative to other patterns I've made, are not very deep. I like that, I think. Believe it or not, I am wearing Petulance. I gave my students their final exam yesterday and, when I got home in the evening, I decided that I deserved an evening just to sit and knit. I don't have a photo yet, but I should soon. My brother-in-law is in town, but I hope to steal my Ace Photographer for three minutes. I like this top a lot; it is not too big, after all, though it took a full ball of yarn more than I expected. Maybe it's all the moss stitch at the bottom...or maybe a ball is floating around the house somewhere and I don't know it. In any case, Petula is a nice little pattern and as easy as pie. You will laugh -- it's cool today, so I'm wearing Petulance and a Linen Drape cardigan (Salsa, Rowan 33) on top! Maybe I'll use my leftovers to make a mini skirt. No, not really. In the post with the photo I will tell you how good it was for me to get involved in this knit-along. Thank you, Alison! A blog can dream, can't it? Some of these are clearly aspirational for this site, though they might apply to our sister site. Shaggy certainly fits here, though. I saw this in a few different spots -- most recently at chicknits and passionknit. Another blogger whose identity I forget plugged in her blog's name...I thought that would be more fun than the measely four letters in my moniker. I've finished one side of Petulance and should soon be finished with the other. It would be great if I could wear the thing to the next KIP, which is a week from tomorrow. I'm slightly concerned that it will be too big. If it is, though, Emma's May 31 post describes her success with shrinking Linen Drape, so I'll just push on and see what happens. What would I do without the blogs? We planted flowers in the front and back yards of our condo building today, which was a lot of fun. The sod I laid last fall in the back survived the winter very well and looks good. Now I have to watch for the August die-off...last August, the whole thing (OK, it's only a 6' by 6' square) died and I had to re-lay new sod. I blame inattentive neighbors and/or grubs. I'll be ready with a pesticide for the latter and have learned not to rely on the former to take the appropriate care of me little patch o' green. Ronald Reagan...his politics were not my cup of tea, but he seemed to be a decent man, all in all. He clearly loved this country a great deal and stood consistently and compellingly against the Soviet Union. Gosh, remember the Soviet Union?? Certainly he and his family suffered a lot these last ten years, and I hope both he and they have found some peace after a long ordeal. It really is something, isn't it, to think about all the cultural and technological changes he and the men and women of that generation witnessed.